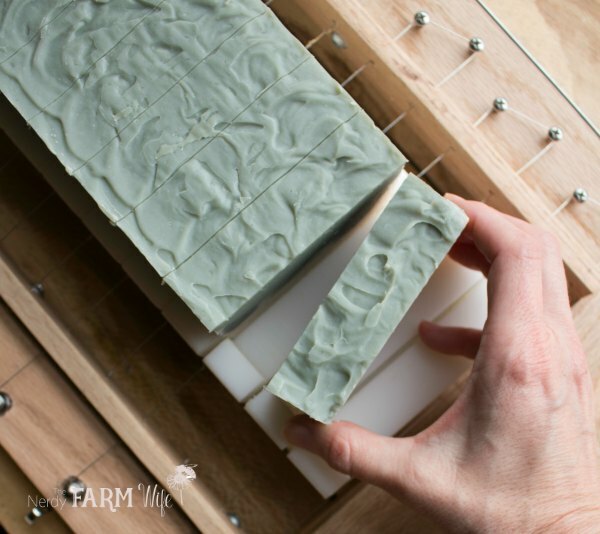 Learn why you need lye to make soap and how to handle it safely. Our great great grandmothers made soap without having to use a caustic chemical, so why do we? The short answer is that our grandmothers manufactured their own caustic chemical of sorts, called potash, by combining hardwood ashes and water. This created an extremely strong alkaline substance that was considered ready when it would dissolve a chicken feather. The caustic wood ash solution was then mixed with fat rendered from butchered animals and boiled over an outdoor fire for many hours until a soft soap was formed. While this method resulted in a truly natural soap, it was also difficult to control the quality of the final product. Using these types of lye and precise measurements, we’re able to consistently produce batch after batch of gentle soap. What happens if you leave the lye out of a recipe? Without lye, the oils in your recipe would stay oils. Nothing would happen to them. A chemical change involving lye must happen in order to create soap. Can you use glycerin instead of lye? Some people mistakenly believe that glycerin can be used instead of lye. Glycerin (a humectant that’s good for your skin) is actually a byproduct of the soapmaking process and will not transform oils into soap. If you try to use glycerin instead of lye in a soap recipe, it would be sort of like trying to start a fire with a fresh rose petal instead of a match. It just won’t work. 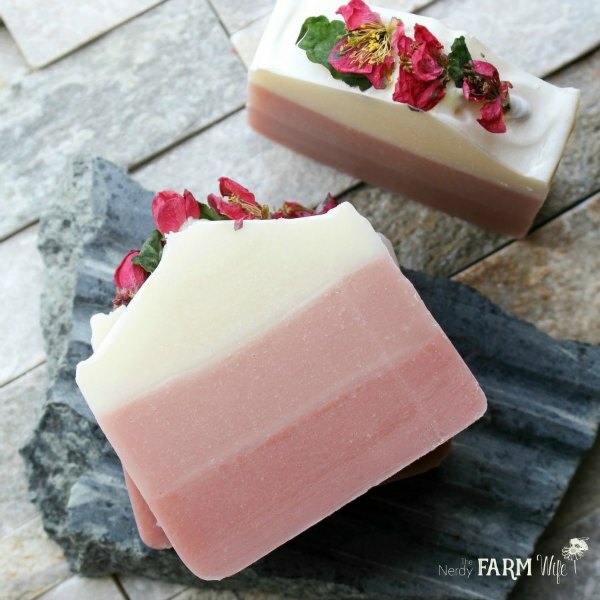 What about organic and natural store-bought soaps? Aren’t they lye free? All true soaps are made with some form of lye. If not, then they’re detergent based products. Some, like Dr. Bronner’s soaps, are made simply with just lye, oils and a few natural extras. Others, like Dove, are made with a combination of lye and detergents. 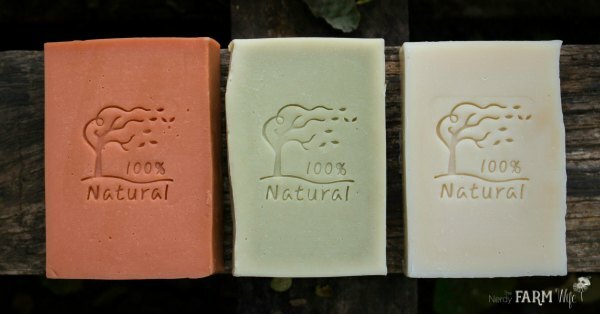 How can such a strong substance create a mild and gentle soap? 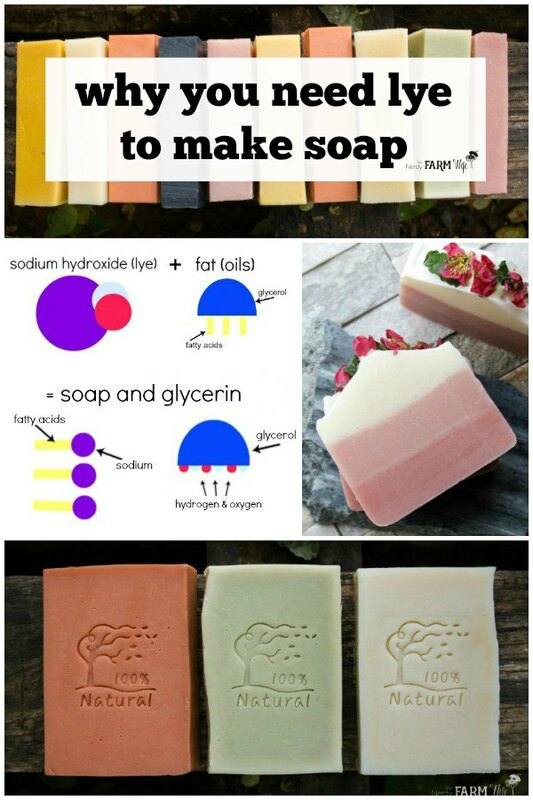 You need lye to make soap, even natural ones, but it just doesn’t make sense at first thought, does it? Hopefully, this section will give a better idea of how that happens. 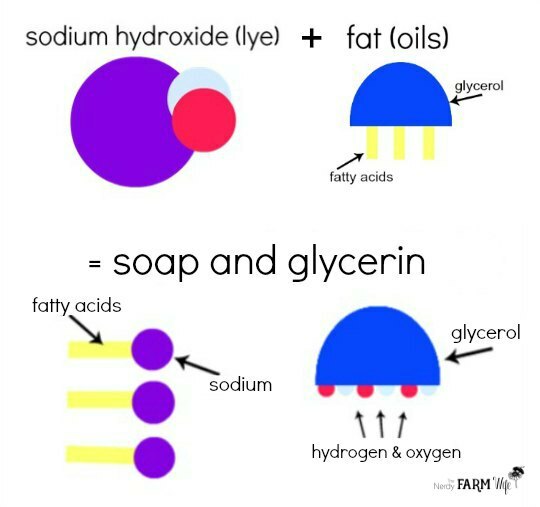 With apologies to real chemists everywhere, below is a super-simplified illustration of how lye (sodium hydroxide) and oils/fats (glycerol & fatty acids) combine to make soap. In the presence of heat and water, the “fatty acids” bond with the “sodium” part of sodium hydroxide and form soap. The “glycerol” and “hydroxide” parts form glycerin, which is great for your skin. No lye (sodium hydroxide) is left in the final soap! Are you afraid of lye? If so, you’re not alone; many people are. I can relate, because I was the same way! 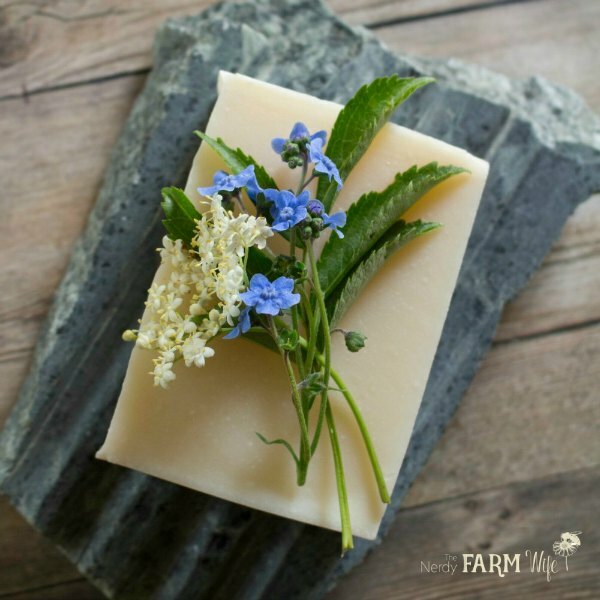 When I first started making soap, I was terrified at the thought of using lye and had my husband handle that part. 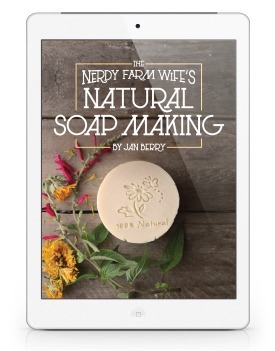 After making my first successful batch of soap though, I realized…. lye isn’t that scary after all! If you’ve ever safely worked with bleach or another strong household chemical, you should be able to handle lye just fine. The main thing to remember is that it’s a caustic substance. Just like bleach, you don’t want to drink it or get it in your eyes or on your skin. The fumes aren’t good to breathe in either. There’s no need to fear lye, but it does deserve a good deal of respect and care when handling. I’ll share a list of safety tips below. 3. Always add lye to water, and not the other way around. You can remember this by thinking about snow flakes falling on a lake. (Flakes of lye, falling on the water.) If you mix up the order (and I have before), it won’t blow up or anything, but could bubble up and overflow out of a small container. In my case, nothing out of the ordinary happened, but still, it’s good to go by the recommended order. I also suggest mixing the lye solution in your kitchen sink to contain any spills. 4. When lye first meets water, it gets really hot, really fast. Use room temperature or cooler water/liquids, since warm liquids can overheat and overflow. Don’t use glass for this part because it could shatter. The lye solution will also give off strong fumes for about 30 seconds or so. Don’t breathe these in and be sure to work in an area with good air flow, or even outside. If you have breathing problems or are concerned about the fumes, wear a respirator mask. 5. Don’t leave bottles of lye, or containers of lye solution, around where pets, children, or other members of the household could accidentally spill or drink them. Drinking lye can be fatal to both humans and pets. Don’t make soap with pets or small children around. * Remember, these safety tips are in place to help prevent worst-case scenarios. People make soap all over the world, every day, without incident. Work carefully and responsibly at all times. 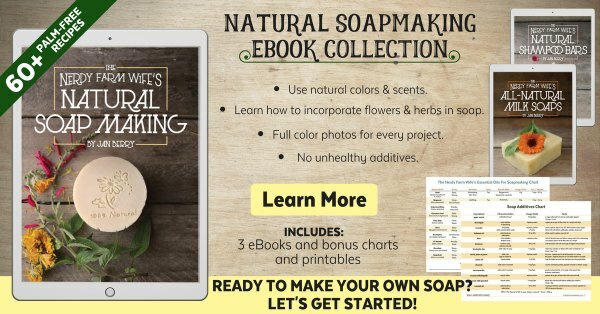 Want to learn more about making your own soap? If you enjoyed this article on why you need lye to make soap, let’s keep in touch! The information on this site is for idea-sharing only. While this site does its best to provide useful information, any reliance you place on such information is strictly at your own risk and not a substitute for medical, legal, or any other professional advice of any kind. Tagged why lye. Bookmark the permalink. Great explanation, I get tgis question a lot. I am curious to try the potash method though. Hi Liz! I’m glad you enjoyed the article! 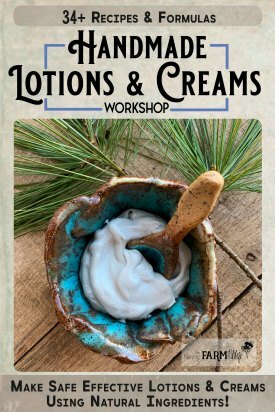 I’ve always wanted to experiment with making lye from wood ashes too; it’s on my things-to-try-one-day list! Hi Kristin! Happy you found the post helpful! in one of the pictures above the soap is being cut with what lookes like thick dental floss. It also looks like it is a press of some sort. where can I find something like this to cut soap? Thanks. Hi Brian! Glad to hear you’re enjoying the site! I have a question. If I need sodium and hydroxide why can’t I use their pure forms instead of lye?